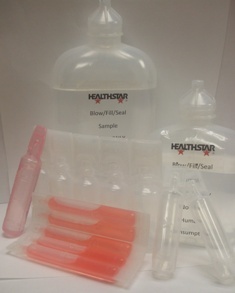 Blow/Fill/Seal Technology - Randolph, Massachusetts - HealthStar, Inc.
At HealthStar, our ability to refurbish, upgrade, and re-manufacture blow-fill-seal packaging equipment is unrivaled in the industry. 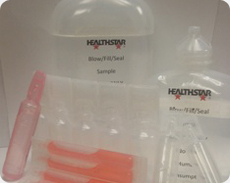 Blow-fill-seal, or BFS, packaging is considering by the FDA and health experts worldwide to be the ideal way to process aseptic products such as pharmaceuticals, food, and personal care items. Because maintaining a sterile environment is so critical in many BFS applications, the repair and refurbishment of this equipment requires a great deal of experience and expertise. We have been serving the needs of the pharmaceutical and nutritional product industries for over 30 years. By employing an expert mechanical, electrical, and manufacturing engineering team, we are able to provide advanced processing equipment which utilizes innovative packaging technology. Applications engineers can assist customers in developing processes that best meet their needs for a wide variety of applications. Existing machinery can often be modified to meet a specific application. If no standard solution is available, custom equipment can be developed in our research and development lab. Equipment is manufactured and refurbished in our internal facility by skilled technicians who have been trained in the latest manufacturing and assembly technology. We are uniquely qualified in the refurbishment and upgrading of blow-fill-seal, or BFS equipment. By upgrading or rebuilding existing equipment, customers are often able to achieve significant savings and reduced lead times compared to new construction.